Check. Check 1. Check 1-2. Chuck. Chuck Toast. So, um, hello! In case you don’t seem to know me, or in the more likely case just can’t remember me, I’m Puddin. I mostly do all the nonsense rambling around here. Well, at least I used to. I’m sure you remember my previous work here? Yes, let’s all conjure some rose-tinted memories of the halcyon days of yesteryear (you know, like, er, October) when Puddintopia was the kind of blog that actually had new posts published with some regularity. Like, several times a week even. Or whenever I had a brain mite twitching around in my grey matter making me want to Write The Crazy Down for Posterity. But alas, November has a been a dark, cold month. It’s been thirty days of hanging on sporadic haiku and bad limericks, and cringing at tumbleweeds as they roll across the website like an old, abandoned mining town. Look, I’ll just come out and say it: I’ve been a bad, horrible, absentee blogger. 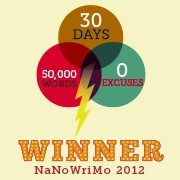 All this, of course, can very squarely be placed at the feet of the one unarguably culpable party: NaNoWriMo. Well, kiddies, I haz Teh Good Newz. At 9:16 PM last night, I finally finished it. If it’s been tweeted, it has to be true, right? So. Yes. The exceedingly awesome news is that I have, in fact, finished the first draft of my second novel. It’s a Middle Grade Science Fiction story that I’m looking forward to having my kids read. And yes, writing a book my grade-schoolers might be interested in reading was a big factor in deciding to do NaNo this year. Of course, because I wrote the entirety of the thing in a mad, frantic 29-day dash of vomiting words into a document like I had some very specific, very unusual form of Tourette’s, this particular manuscript isn’t going to be fit for human consumption for possibly months yet, I reckon. Well, short of hobos burning it in a steel drum for warmth and a little Holiday cheer, that is. I guess it’s fit for that type of consumption straight away. Of course, it’s a gibbering pile of word slop at the moment, but hey, it’s a draft, right? At the moment my new precious baby manuscript – big brother Famine will just have to get used to having a sibling, I suppose – is a cobbled together patchwork of some great ideas, some crap ideas, some fun characters, some partially realized characters, and a stable-as-a-house-of-cards-plotline mixed up with a dash of uneven narration, and a somewhat sporadic Voice. So I’m going to take a few weeks and let it sit there, by itself, and think about what it’s done. Let’s say we hope it will use that time to, um, ripen, I guess. Or something. Whatever. The point is, in a few weeks, or possibly after the first of the New Year (assuming that whole Mayan End-of-the-World thing doesn’t ruin Christmas, and like, everything else too), with my mind focused on revisions, I’ll pick up the manuscript with fresh eyes, a hammer, a cleaver, and one of those dog poop scooper things you see the prim ladies carrying around in the neighborhood. In other words, I’ll roll up my sleeves to get busy on making this new novel not just finished, but awesome. But for now, I’m pretty damn happy with myself for sticking to, and ultimately completing, a task I thought sort of ridiculous at the outset. Oh, and yes, I’m officially back in the saddle here at Puddintopia. I hope you all still care enough to follow along. Now, if you’ll excuse me, I have a celebratory bottle of beer to open.